Utility companies from the UK alone create over 1.5 million street holes each year, often causing damage to third-party assets. Damage can be both expensive and dangerous, while also seriously impacting a company's reputation. Outdated and inefficient systems account for a great part of faulty interventions that costs the British economy in the region of 5.5 billion euro annually. To address these issues, a consortium stemming from six European countries established the LARA initiative. The project developed innovative mobile technology to cut down these unpredictable maintenance operation costs that are often paid for by tax payers. "LARA's mobile technology enables the field workforce to view geospatial data securely on site, instead of relying on old systems and their own individual experience to interpret maps," states Mr Konstantinos Smagas, deputy project coordinator. The LARA system is a handheld, low-cost mobile device that enables field workers to 'see beneath the ground'. The device brings together Global Navigation Satellite System (GNSS) technology, 3-D geographic information system (GIS) technology and geospatial databases with computer graphics and augmented reality to render complex 3-D models of underground networks including water, gas, sewerage and electricity. GNSS technology includes Galileo and EGNOS as well as GPS. LARA's high-precision, low-power, long-autonomy GNSS receiver module is able to achieve accuracies at the level of a few centimetres. "The receiver – which consists of a GNSS module and an IMU module – is able to work with multiple constellations including Galileo, EGNOS, and others, but Galileo is key to helping improve accuracy, increase availability and integrity," points out Mr Smagas. Fusing augmented reality with GIS technology is key to the LARA concept. Acting like a "3-D X-ray vision", augmented reality enhances the user's perception of the underground infrastructure with virtual data. Superimposing digital data on GIS display content not only adds to the user's experience, but also makes GIS useful in a new and interesting way. Pinpointing the exact location of underground utilities is critical to the safety and mission of utility field workers. Other than this, poorly mapped regions slow down work and add an element of uncertainty to the work of excavation teams and their office-bound supervisors. Being able to identify underground utilities located in an excavation area prior to conducting the work is a game changer for public and private utility companies. 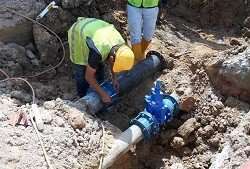 "With the LARA system, they will know exactly 'where is what', thereby conducting far more accurate maintenance interventions on their own underground infrastructure while keeping other neighbouring underground grids intact," explains Mr Smagas. Precise intervention will reduce the overall maintenance cost, at the same time minimising the economic and social implications of lengthy surface works. The latter include unnecessary traffic congestion, pedestrian disruption, material wastage, use of people's time, increased energy demand, visual intrusion and noise. To aid smooth market adoption, they have brought together a broad range of stakeholders and have been particularly active in networking activities. Launching of a dedicated website, press releases, official publications and international conferences have greatly helped LARA achieve its dissemination goals. For the time being, the consortium is performing minor improvements regarding the system usability and autonomy to showcase their technology in two major utility companies in France and the United Kingdom. Once the final prototype is completed, LARA's affordable and simple-to-use system is expected to have a significantly positive impact on the competitiveness of the European utility industry as well as equipment vendors.